An exploration of what it means to discover the “other” and transform oneself through human connection. Performed at Lightlab performance series, March 2016, with Connor Hestdalen. Two performers work within the landscape of emotional intimacy through movement, manipulation of objects, and sound/breath experimentation. 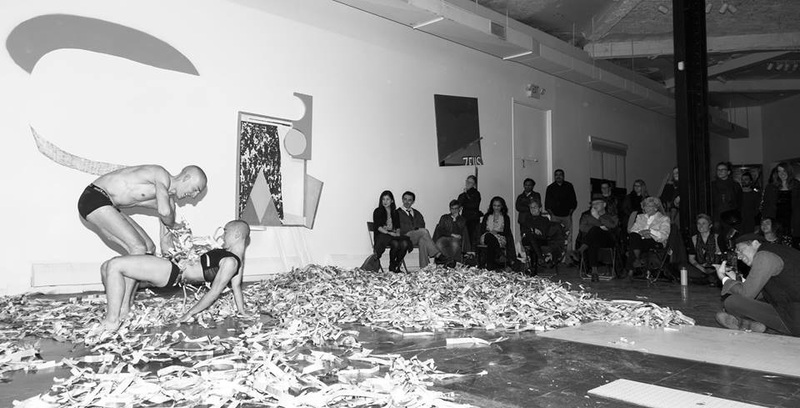 They experience mood shifts in real time throughout the performance and expose the ridiculous nature of “keeping it all together.” Performed at PAF, August 2017, with Roberta Guido. I am continually experimenting in short solo works with concepts of queer and trans identities, transcending the systems we exist within, and exporting the mundane as tools of liberation. Follow me on Instagram (ru.e) for updates on upcoming performances!